By Allan Fox: WBA light welterweight champion Marcos Maidana (31-2, 28 KO’s) will be stepping up in weight this Saturday night against a home fighter Devon Alexander (22-1, 13 KO’s) in an HBO televised fight at the Scottrade Center in Saint Louis, Missouri. You got to like Maidana’s courage by taking this fight in this venue, because Alexander is batting a 1000 in fighting at home in Saint Louis, where he may be unbeatable in terms of fights that go to decision. Alexander brings in lots of fans that cheer wildly for him every time he punches and somehow the judges just lean his way in lose fights. It happened in his controversial wins over Andriy Kotelnik and Lucas Matthysee. Now it’s going to be Maidana’s turn. 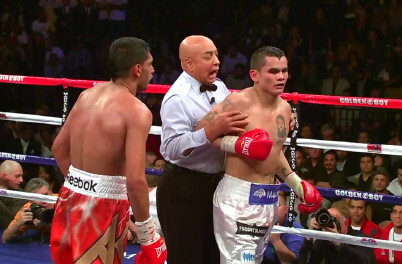 It seems likely that Maidana will be out-boxed in this fight. so it may be neither here nor there about judges. He’s not as skilled as Alexander, not as quick and doesn’t move as well as him. What Maidana does bring is a lot of power and a ton of pressure. He’s the type of fighter that Alexander does really well against historically. However, Maidana is always dangerous and he may get lucky and land something big and finish Alexander off. The chances aren’t good in that happening, through, because Alexander has a great chin and is good at moving around the ring to avoid Shots. To be sure, Alexander is going to have to change his game for this fight because he can’t afford to stand in there and trade with Maidana for 12 rounds like he attempted to do against Timothy Bradley last year. Alexander got worn down by Bradley in close and ultimately quit after getting hurt by a headbutt from Bradley. Maidana knows what he has to do to beat Alexander. He’s got to go after him and stay in close and give him a real beating on the inside. Alexander may be foolish enough to try and fight him in close and that’s where Maidana has a real chance in this fight.